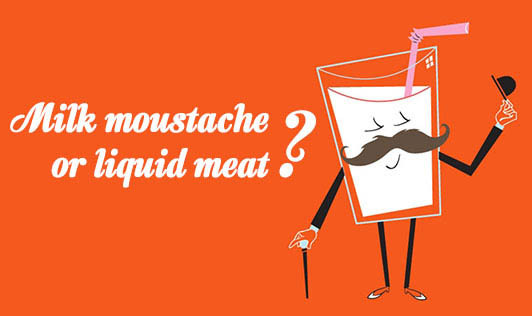 Milk moustache or liquid meat? The ongoing debate on "milk good or bad", doesn't seem to end. On the one hand, we have researchers, food experts, dairy professionals and milk supporters. On the other, we have researchers, food experts, non-dairy professionals and milk non-supporters! Which way do we go? This debate is not confined to India alone. It is prevalent in the West too. The pro-milk group has rigorously promoted the `Milk Moustache' campaign, which include celebrities like Whoopi Goldberg and others. The anti-milk group thinks of it as "liquid meat" and many people avoid milk, especially those who are vegetarians, fat-conscious, cholesterol-conscious or environment-conscious. The pro-milk group highlights the nutritive value of milk. There are calcium, phosphorus and Vitamin D for bones, proteins for growth, riboflavin for metabolism, Vitamin A for eyes and Vitamin B12 for blood. Of all the above nutrients, calcium in milk is the most talked about. Milk is a nonnegotiable food item in many homes because of its calcium and protein content, especially for children. Many mothers flavour the milk or disguise it in the form of tea to make their children drink milk. The anti-milk group talks of increase in the risk of breast cancer, prostate cancer, etc associated with milk consumption, based on population studies. The risk increases because of the estrogens, chemical contaminants and IGF-1 (a growth-promoting factor) and this happens even with skim milk. Flatulence, allergies and diarrhoea can occur with milk consumption, in susceptible people. Lactose intolerance (inability to digest the lactose in milk due to insufficiency of an enzyme, resulting in digestive discomfort) is believed to be more prevalent in Asians than others. Though milk was thought be a sure dietary cure for hyperacidity some years ago, it is no longer recommended for this problem. The high amount of saturated fat in milk is a no-no for heart disease. What are we left with? Let's see the facts. Milk has great nutritive value: 100 ml of milk provides 67 calories, 3.2g protein, 4.1g fat, 120mg calcium, and 180mcg of carotene. The minus points are that milk contains cholesterol, part of the fat present in milk is saturated, and milk contains no fibre. We can't deny the fact that many are lactose intolerant and milk causes problems for them. Unfortunately, there is no lactose free milk available in India. Curd and buttermilk are excellent alternatives especially for the lactose-intolerant because the lactose is better digested. But these milk products are frowned upon by modern attitudes. Unfortunately, aerated drinks are replacing lassi. Calcium is not found only in milk but many other foods. The poorer sections of society that cannot afford to drink milk, neither complains of osteoporosis nor takes calcium supplements any more than the affordable classes. How do they manage to get their calcium? Non-dairy foods contain good amounts of calcium. In 100gms of edible portion, we have ragi with 344mg calcium, soybean 240mg, horsegram 287mg and rajmah 260mg. Most of the green leafy vegetables and most varieties of fish are good sources of calcium. Some of the oilseeds and spices are very high in calcium and even in small quantities, they contribute fair amounts of calcium to the body. Milk gives good quality protein with the essential amino acids. These amino acids can be obtained from a plant food diet too. Practitioners of alternative systems of medicine believe that while milk increases phlegm in the body, milk and milk products can be taken by those who can tolerate these foods. In other words, milk suits some body types and doesn't suit some. So, take it if it suits you. This might be true of the pure and good quality milk that used to be quite common decades ago. With commercialisation and environmental changes, can we be assured of milk like our grandparents had it? If not, can we freely buy organic milk? Is it time for someone to consider bringing soy milk back into the market? Meanwhile, in my opinion, take skim milk, skim curd or buttermilk in required quantities if they agree with your system. If they cause dislike or discomfort, avoid them and look for other sources of protein, calcium and vitamins. Nature has provided us with plenty of options. Choose what is healthy for you!